Kimber is wonderful to work with. 10's across the board. Clean and comfortable. Access to Solterra Rep was a 10. Ease of booking and advertising accuracy also a 10. Excellent - Well done Kimber! Reservation process, no problems. Thank you again for helping us out with accommodations for the last three months! We truly appreciated your professionalism, exceptional customer service and the ease of our entire experience from beginning to end. We will definitely be recommending your services to family and friends. Jason and Tanya. 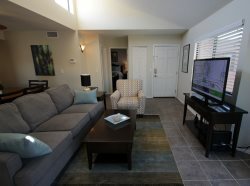 Solterra Vacation Rentals has a variety of short-term rental units that are well described and vetted. Solterra is easy to work with and very helpful. My wife and I needed a temporary home while we looked for a house to buy in Tucson. We chose Ventana Vista Condo 2191 and rented the unit for ten weeks. We were pleased with our choice. The unit has been recently renovated in good taste. It was very nicely furnished and as my wife likes to cook, she appreciated the fully equipped kitchen. The condo was a welcome respite after a day of house hunting and later after working through the new house purchase details and moving in. We have only positive comments to say about Ventana Vista Condo 2191 and recommend it highly. You had everything down to a science. This house was lovely. Very clean! We had everything that we needed. We loved watching the birds, saw some Javelinas and his morning 6 deer were looking over the fence at us. You had everything down to a science, this morning I needed a needle and thread and there it was in the drawer. Friendly neighbors. Beautiful place. We enjoyed ourselves again this year. Generally, place was very well equipped and stocked. We hope to come back next year! Kimber is great! Very responsive. This owner paid great attention to detail. Really works to make this rental comfortable and appealing. LOVE getting the daily newspaper. We actually did a lot more activities in Tucson because of what we found in the paper. Appreciate having items not often found in other rentals. A laundry basket for dirty clothes, adequate hangers, extra light bulbs, cold water in the refrigerator upon arrival, stater supply of cleaning items, broom/mop, etc. Many thanks! As always - outstanding job. We really enjoy working with you. THE VIEW! Location, location, location! As always our stay has been easy to book and properties are great! It is wonderful to wake up to bright blue skies and sunshine everyday. The convenience of the shopping center and the wonders of Sabino Canyon make everyday a pleasure. Your online registration, payments and easy check in was great. This condo is well equipped and homey. Patio was so nice to view nature. Attractive decorations. Good, convenient location. Well equipped and maintained. Good location. We appreciate that you and the owners were able to work with us and were flexible with our check out dates. Our new home purchase was a stressful nightmare .... It was nice to have a wonderful home to come home to everyday! Please pass along our appreciation to the owners as well. We will wholeheartedly recommend Solterra Luxury Rentals and Condo 130 at Vistoso Casitas to everyone! Thanks a million! The attention to detail in provided amenities is outstanding! Loved the adequate cleaning supplies and personal toiletries. Kitchen is well stocked with all necessary cooking utensils. More than one towel per person appreciated so that small loads of laundry were not necessary. Loved the number of hangers AND laundry basket - something very few rentals provide. Beautifully decorated. Kitchen was well stocked. I want to let you know how much we absolutely loved this house! We couldn't get enough of the patio, birds, soothing sounds and the peacefulness. There were many hikes and bike rides and we saw many wonderful sites of your beautiful town. We stayed during January 2017. I had several thoughts when I opened the door to our condo: 1. Everything was so neat and clean. 2. The decorating proved that we were really in the southwest. 3. The views was spectacular. After exploring the condo, I found the kitchen had more dishes and utensils than I expected. Everything we needed to be comfortable in our cozy condo was there. This was our first experience with a vacation rental and it could not have been nicer. Kimber is just the best! Property looked just like the pictures. We have been very pleased. Beautiful condo and beautiful grounds. Well kept pool. Kitchen and bathrooms very well stocked. Rooms beautifully decorated.